Your overhead door is a complicated system, and over time it will inevitably develop various problems. Our technicians can repair any of these issues, from dented tracks and damaged panels to faulty opener wiring and more. You can rest assured that when you reach out to our team, you get the best service specialists around. The “brain” of your overhead door system is the opener. It consists of many different mechanical and electrical parts, all of which must work together in perfect synchrony. Unsurprisingly, there are many different issues that such a complex device can develop, but thanks to our vast experience, our technicians can quickly identify what’s wrong and apply the best solution for the problem at hand. We can reposition misaligned safety sensors and replace everything from the motor gear to the circuit board. If the drive-system is damaged, we can address that as well, and, should the situation prove severe enough and beyond repair, we can perform a complete opener replacement, and get your door back into working order in no time at all. Your system relies on one or more heavy-duty springs to do all the heavy lifting. Unfortunately, that means that these components are under a lot of strain on a daily basis, and they will weaken over time and eventually break. That's why it’s important to replace them when they begin to wear out, otherwise you could be looking at a more serious problem when they snap. Whether your torsion or extension springs have already broken or are about to, we can replace them safely and quickly, and make sure that they are properly lubricated and adjusted. We strongly recommend that you don’t attempt to carry out any spring repairs by yourself, since these components are extremely dangerous and must only be handled by professionals. A dented panel can ruin your door's curb appeal, which can be incredibly important, especially if you're planning on selling your home. Our technicians can quickly eliminate these unsightly blemishes, or even replace the entire affected panel with one of a matching design. We work with major door manufacturers like as Clopay, Amarr, and Windsor, so you can count on us to always find the perfect match for your door. Whether you need an emergency spring replacement, or you need us to realign your vertical or horizontal tracks, our team is ready to help. 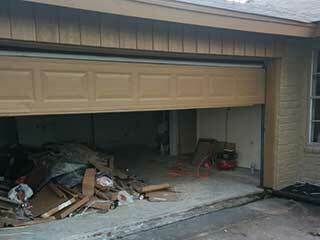 Contact Garage Door Broken Spring Orlando today to get our technicians to take care of all your problems.